OHS aims at making the medical simulation available in the medical curriculum and in the hospitals. In recent years, many technological innovations rose in all medical fields in order to optimize surgical operations, to decrease the time spent in the operation room and therefore the healthcare costs. However, these novel technologies increased the complexity of surgical procedures. Nevertheless, surgeons and interventional radiologists are supposed to learn and then practice during an important amount of time to be considered as experts in their respective domains. Moreover, no curriculum exist to evaluate the clinical practice of medical student. Medical curricula suffer from a significant technological gap. In the digital age, medical students rely on an intense theoretical learning (using books), and then train on patients under the supervision of a senior surgeon. Numerical tools allowing to teach, train and assist surgeons are compulsory. Companies already propose tools for medical simulation, but their products are often mono-disciplanary and especially expensive (over 50k€). The latter drawback prevents from spreading simulation-based technologies in medicine. The development of multidisciplinary simulators which students could even afford is key in the emergence and the generalization of simulation centers. Implementing a medical simulation can be complex and time-consuming. Our project rely on an innovative technology for simulation: the SOFA platform. SOFA is an open-source framework developed by several Inria research teams. The cutting-edge algorithms available in SOFA allow to prototype a simulation in a few weeks, thus decreasing the development costs. 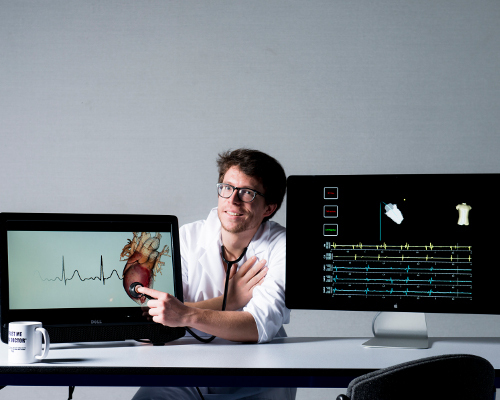 The Open-Health Simulation (OHS) has been rewarded in the national I-Lab competition. The I-Lab prize is first a financial support, the acknowledgement and the promotion of the OHS project. I-Lab will allow us to fund the first steps of our idea ! Inria wrote also an article Inria detailing the Inria awards of the I-Lab competition. To know more about the project, do not hesitate to contact me.